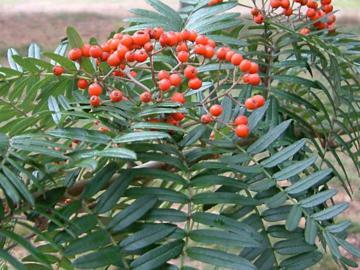 Small tree with spreading branches and distinctive frond-like pinnate leaves, composed of up to 33 neatly arranged narrow, glossy dark green leaflet, grey-downy underneath, colouring to rich red and purple in autumn. Leaves have leaflets with toothed edges. Flattened corymbs of white flowers in spring, followed by clusters of small red berries in autumn. Discovered and introduced by E.H. Wilson in 1904.